14", Brown and white dense curly mohair, black glass eyes, waxed floss nose with air brushed coloring, an open mouth with molded teeth and tongue, stuffed with polyester and pellets, beige 6 piece suede paw pads with air brushed shading surrounded by curly red brown mohair. Fully jointed. 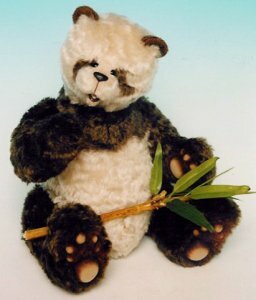 Fabian Song is an award winning Teddy Bear artist from Singapore known for his very original designs.